The strong and lasting friendship between the United States and Japan is bolstered not only by strategic military considerations and historical connections, but also community ties. Communities throughout the United States hold Japan-related celebrations inspired by traditional festivals (matsuri), in efforts to strengthen bonds between both nations. These celebrations also serve as learning opportunities for individuals curious about or interested in Japan and Japanese culture, as they often offer activities, performances, demonstrations, and delicious food. Springtime celebrations of Japanese cherry blossom (sakura) trees have experienced tremendous popularity in the United States. Crowds flock across the country to witness the beauty of the blooming sakura, a symbol now synonymous with the arrival of spring. 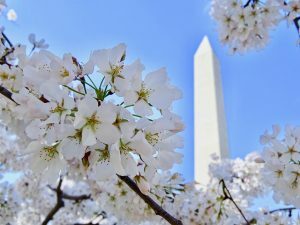 The most historic of these celebrations is the National Cherry Blossom Festival in Washington, D.C., a festival that traces its roots back to 1927 as a commemoration of the gift of more than 3,000 cherry blossom trees sent from Japan in 1912. Ever since, cherry blossom celebrations have grown larger in scale and number throughout the nation. Macon, Georgia, known as the “Cherry Blossom Capital of the World,” holds the International Cherry Blossom Festival every March, when the city’s 300,000+ cherry blossom trees bloom. Cherry blossom festivals also take place in Seattle, Nashville, Philadelphia, San Francisco, and more. 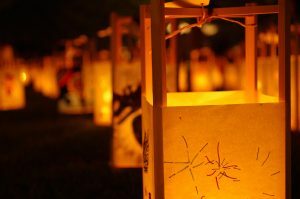 Other festivals take inspiration from Japanese cultural traditions, like lantern festivals, traditional New Year’s celebrations, or the Buddhist summer Bon Festival. With the explosion in popularity of Japanese pop culture, conventions have also gained prominence in recent years, attracting fans of anime, manga, J-pop, and more. Some cities also commemorate their relationship with their Japanese sister cities through special celebrations. For example, Newport, Rhode Island and its sister city Shimoda, Japan, both celebrate an annual Black Ships Festival, while Cupertino, California, celebrates and promotes its sister city relationship with Toyokawa, Japan, through an annual cherry blossom festival. Below, you can find a list of annual Japan-related festivals and celebrations throughout the United States. The list is not comprehensive, so be sure to stay on the lookout for other possible events in your area. Know of an event we missed? Send us the details: JUMProgram@spfusa.org.